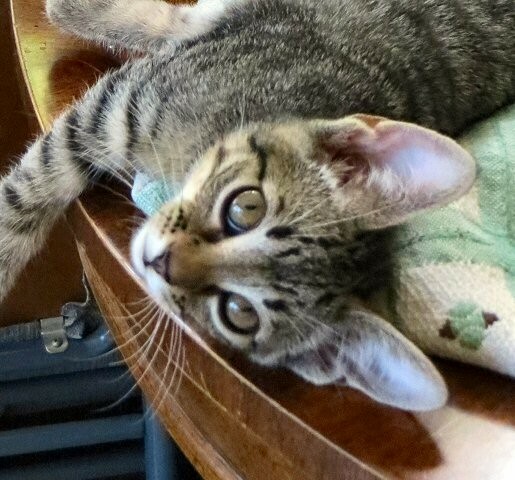 Three weeks ago we adopted a rescued family of cats — cats we never expected to share a home with. 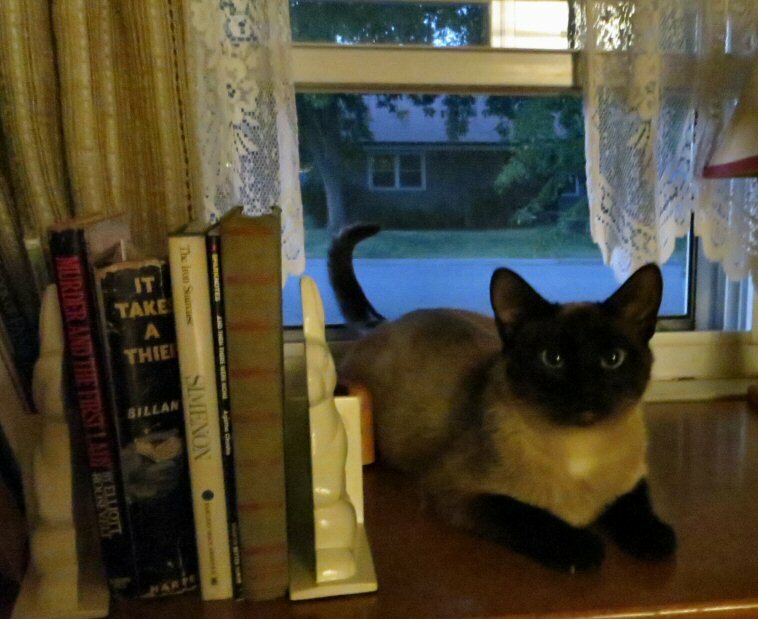 We’d recently lost Dinah, our 19-year old blue point Siamese and we didn’t think we’d want to ‘replace’ her. Dinah was special. We reckoned without our veterinarian daughter who, apparently, is our enabler. 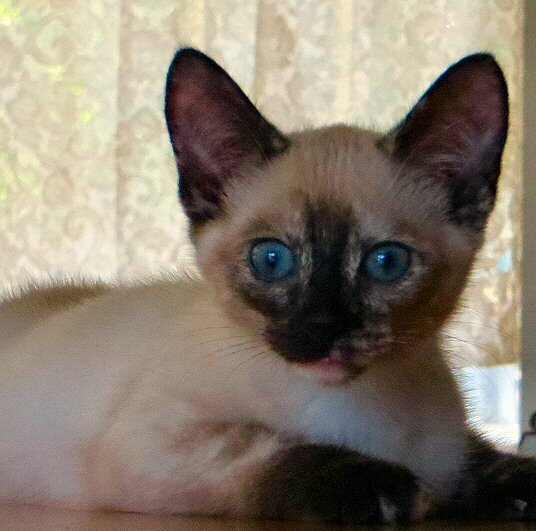 Mama-cat is a seal point Siamese, and the two kittens who came with her are a tortie point polydactyl (6-toed) Siamese and a brown tabby who looks as if he wanted to be an Egyptian Mau. We are charmed by all of them. As is usual with new members of the household, we needed to be able to call them something. “Hey, you! Get off that!” is unwieldy and too nonspecific, plus it isn’t something a kitten ever responds to. The names I suggested for the two cats we initially intended to adopt were Polly and Ernestine. Polly sounded perfect for the tiny polydactyl girl kitten, and Ernestine would have been just too cute for her mama as Ernest Hemingway had a thing for polydactyls. I was voted down by the local Philistines. The next round of names were Cocoa and Yum Yum for mother and daughter. When I’m feeling fragile I like to read or listen to gentle stories such as those by Lilian Jackson Braun who named her two main character cats Koko and Yum Yum. Braun was inspired, I assume, by characters from The Mikado, my favorite Gilbert & Sullivan operetta. Koko was a male character in the operetta so Cocoa seemed appropriate for a pretty girl with dark brown Siamese points. Then they came home. Not only did they come home, but one of the little boy kittens came with them as all the kittens had so much fun with each other it seemed cruel to separate them. Once the cats were home, we saw that Cocoa didn’t fit the shy mama cat (who has yet to really come out from under the bed) — the repeated k-sounds in the name were too hard. Yum Yum was fine for the little girl but without the Cocoa/Koko companion name, it felt incomplete. Since my ideas for names weren’t working, I let nature take its course with the rest of the family, and they filled in the gap. We now have three named cats: Minka (courtesy of our daughter, who Googled German cat names), and Audrey and Rusty (courtesy of our son who likes the National Lampoon vacation movies). Here’s where it gets odd. Yesterday I opened a Word file from 2009 in order to edit the second short story in a series for a main character I’ve been developing. The storyline is irrelevant, but with character names that made me think I ought to be hearing Twilight Zone music. I don’t have a Rusty in the story, but I do have an Audrey and a Minky. — One name in common is a reasonable coincidence, but two names are decidedly odd. — Two names that I thought up is a reasonable coincidence, but two names from two people who haven’t Clue 1 about the story, or that I’d even written it, is again, decidedly odd. I had thought to remove the cat from the story (an unfortunate victim, but from carelessness, not anything horrid) but with the coincidence of the names, it has to stay in. I want to think that what I write comes only from my own imagination but the Audrey and Minky/Minka coincidence makes me feel that maybe I have a muse laughing at me from a corner of the room.